What a swell idea, brought to you by Government Motors. It’s a four passenger car, which contains a battery that weighs 375 pounds, and in order to compensate for the heavy weight of the battery, the vehicle’s construction makes use of carbon fiber material. (Carbon? WTF? ), which is probably about as crashworthy as, say, cardboard. This automotive gem carries a list price of $41,000, before you begin to add doodads. Not to worry, though, as I’m pretty sure the taxpayers will subsidize some of the cost. You plug the car in at home (it takes ten hours to charge), and that will take you approximately 40 miles. After that, an internal combustion engine kicks in (premium fuel required) and that feeds electricity to the electric motor, which actually propels the car, extending the car’s range to approximately 300 miles. 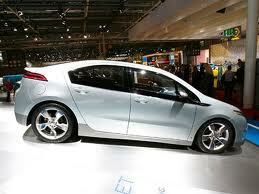 It is contemplated that you’ll bring your Volt home most of the time and plug it in overnight. If you were to drive farther than 300 miles and did not return home for a plug-in, you would have to fill up again with premium gasoline to run the gas engine to generate electricity for the electric motor until you ultimately returned home for a ten-hour plug-in. The good news is that the Volt will create lots of “green jobs,” such as in the coal mining industry, in order to mine the coal that will be necessary to generate all the electricity that will be used by legions of Volt owners who require their daily ten-hour plug in. It will also produce lots of jobs in Korea where the cells for the battery packs will be manufactured by a Korean company, although I’m not sure how “green” the process is for manufacturing those mondo batteries. I cannot help but wonder if these cars will be brisk sellers in anyplace other than Berkeley.